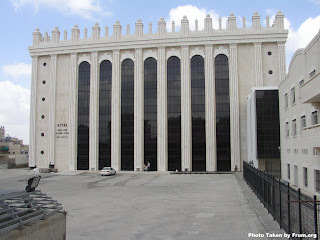 Moreh Nevuchim: The Not-So-Promised Land: Nahag Chadash! 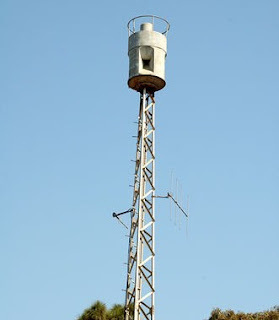 This morning, while everyone was in the middle of hurrying back to yeshiva after breakfast, the air raid sirens went off in Jerusalem. Luckily, I had read the newspaper and noticed a small write-up stating that a test would be conducted this morning. However, it was clear that many had absolutely no idea about the test. In the yeshiva, people asked each other if they had heard the sirens, and what the cause had been. I spoke to several people who hadn't even heard the sirens go off. It sure is a good thing that these sirens didn't need to be heard. What if they had been real? Too bad, I guess. After the sirens stopped, I realized that they weren't as exciting as I had expected them to be. It was simply a constant, loud whining noise that made it sound like the end of the world was approaching, but no one really stirred. I guess in Israel people don't need a reminder that it can all be over at any minute. Actually, it is something that all Jews are supposed to remember. According to Jewish law, we are supposed to repent on the day before our death, so that we confess and open ourselves up to real truth. Since we clearly do not know on which day we will die, the kaballah tells us to do this each day. This is why Sephardic Jews, as well as Chasidim, say vidui (a confession pray) everyday toward the end of Shacharis and Mincha (the morning and afternoon prayer services). This allows us to remind ourselves of our mortality in this world, and gives us a renewed perspective. This renewed perspective should ideally be reinforced by the teaching and encouragement of a manhig. A manhig is a tzadik who imparts minhagim and insight to their followers. What exactly manhig and minhag mean in English is difficult to relate. Generally, one translates the word "minhag" into a tradition, or a uniquely Sephardic, German, Satmar, Russian (and the list goes on and on and on) way of doing something required in Judaism. Many times, it may not even be something required, but simply an act or word or pause used to impart a specific idea or emotion into doing something else that is required. 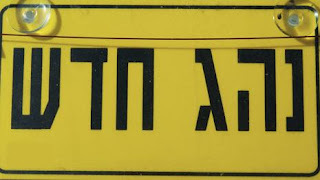 While this translation of minhag as tradition might be common, a more expanded understanding of the word can be seen when looking at a common sign on Israeli cars: Nahag Chadash. Nahag Chadash means "new driver", with the root of the word minhag also forming the word for "drive". So, in essence, a manhig is clearly more than someone who imparts tradition, but actually leads those who find power and conviction in such a person, and the minhagim are more than ways of doing things, but actually help to form ones Jewish experience and understanding. Lately, as I have thought more about what it really means, it has become evident that someone like this is really hard to find. There are certainly thousand upon thousands of people who find themselves attached to this rebbe or that rabbi because they were simply born to parents who were, or perhaps their parents followed so-and-so's father. However, what does this mean for people who think and yearn for something more? I know plenty of people who, after having been born into such a situation where a particularly holy rabbi died and was replaced by a successor, found themselves without a manhig. Had they been more dedicated to the minhag than the manhig, they might have been able to stay and accept that status quoa. This brings me to a question that I wonder over and over again: what is the connection between a minhag and a manhig? Can one follow a manhig who has different minhagim? If you aren't "driven" by these minhagim, then what in the manhig really drives a person? For someone who follows the derech of Rebbe Nachman (and when I say follows, I mean really; none of this "dancing on cars" business), the answer is more simple. The tzadik Rebbe Nachman of Breslov did not encourage his followers to take on any of his minhagim. The way each person found meaning in a particular practice was expected to be unique, as each student of the Rebbe's was unique. This continues to today, where Breslover Chasidus has several groups, each with their own manhig, and each with members who may or may not share minhagim. The common bond among real Breslov is the same as Rebbe Nachman zt"l expected of his original students: simcha (joy). For Rebbe Nachman, following Jewish law correctly was more important than with what peculiarity one followed it, but the one point he always stressed was "ivdu es HaShem b'simcha", to serve G-d in joy. This way of living, taught Rebbe Nachman, can save a person from countless misdeeds. Another tzadik, and a manhig for many, many Chasidim around the world, also shows his preference for reality and belief over following minhagim that are simply status quoa. This rebbe, who rebuilt the Chasidus of his ancestors in Israel, found himself in a unique position. Younger than all other rebbes, he came to view problems of secularization and modernity with new eyes. While affiliated with a notoriously anti-Zionist group known as the Eidah HaChareidis, he accepted money for his schools from the Israel government in the face of claims that doing so was against Judaism. When the Eidah put more pressure on him to fall back in line with the status quoa, he refused, and announced that his Chasidus would no longer follow the rulings and leadership of the Eidah. This led him to create his own system of religious courts and kosher supervision. In addition, he encouraged his Chasidim to not sit and complain about the direction in which secular, anti-Torah parties were leading the Israeli government, but to vote against these parties and replace the parliament members with religious people who would stand against the secular and crushingly Zionist attitudes. This distanced him further from other Chasidic groups, some of which even attempted to slander his reputation, but he didn't budge. Today, his Chasidus runs a successful outreach program for secular Jews looking to become religious. Instead of focusing on how to make new "Chasidim of the rebbe", the yeshivos look at creating Torah observant Jews who happen to look to the rebbe (or any rebbe) for guidance and inspiration, with or without taking on the manhig's particular minhagim. Even in the wake of a recent terror attack on an overtly Zionist yeshiva, with an ideology seemingly worlds apart from his own, the rebbe was the only Chasidic leader to visit victims in the hospital, knowing that achdus (unity) and real ahavas Yisroel (love of a fellow Jew) were more important than age-old stances that might separate someone like him from a someone truly in need. He has also recently encouraged his Chasidim to work in jobs that require secular education, and allowed an "internet gemach" (organization that helps those who do not have access to this service privately) to exist. Talk about a nahag chadash! Perhaps the mark of a real manhig is not in how they teach you to hold the kiddush cup in your hand, but in how they teach you to hold another human being in your heart. Afterall, times change, and it is important to have someone who is as equally dedicated to truth as he is pragmatic. 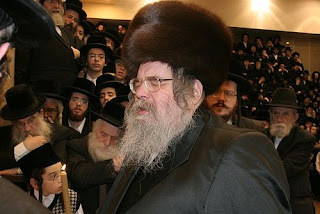 A story goes that when a Chosid close to the Belzer Rebbe saw him doing things differently from the previous Belzer rebbe, he became concerned. Each day he watched closely to see if he was right, and each day he found more and more minhagim and practices that the new rebbe did differently. Finally, after watching for a while, the Chosid gained enough courage to ask the rebbe about this. "Rebbe," inquired the Chosid, "I see that you do things different from the previous rebbe. Can I ask why this is?" The rebbe smiled, understanding what the Chosid meant, but gave him an elightening answer. "I do nothing different from the previous rebbe," he replied. "Just as the previous rebbe did things differently than the rebbe before him, so too I do things differently than the rebbe before me." Indeed, there really is no difference. May we all be zoche to find a manhig who drives us where it counts, and may we all, day after day, each come to approach the world with new eyes and a renewed spirit, a true nahag chadash.